Wilfred Frost: indeed, I am, David thank you very much. The CEO of Wells Fargo Tim Sloan is with me thank you for joining us. Tim Sloan: great to be here Wilfred. Good to see you. Sloan: it does not. When I talk to our customers it’s across the board, corporate, middle market, small business. Commercial real estate they continue to be fairly optimistic about the economy. They will say their biggest challenge is hiring enough people to continue to grow the business in fact, we came out with our Wells Fargo/Gallup small business index today and the results for small businesses were off the charts, highest ever biggest concern, hiring people. Frost: which is a good concern to have. Frost: I guess the markets today are slipping because of fears that the trump/xi trade truce is superficial but it is temporary. Is that a big fear for you and your customers the trade tone could worsen again? Sloan: it could be but when we look at the impact of tariffs related to china on the us and on our customer base, it’s not significant. Nafta would have had a bigger impact, if we hadn’t reached some sort of agreement and Europe has a bigger impact on the u.S. Than china does it certainly impacts those multinational companies that have more of a presence in china. Sloan: at least 100 to 200 basis points higher and again it’s not as much a question of absolute level but a question of the pace if that occurred over one to two to three-year period and was accompanied by economic growth, I don’t think it would have a big impact if for whatever reason -- we can think of a lot of them -- rates would go up 100 basis points, that might have a bigger impact. Frost: jim cramer mentioned earlier on the show you’re often positive on the economy. You really are -- no reason to be concerned from what you see in the u.S. Economy? Sloan: well let me answer that in the following way. That is, I was a history major in college and I believe in history and I believe in cycles. We’ve been in a long economic recovery it’s been a little bit more muted than prior economic recoveries that may mean it’s going to last a bit longer but I think we need to be very wary of the fact that at some point we’re going to have a cycle what we see today in the economy, what we’re seeing from our customers is generally a positive and so we’re not overly concerned. Wilfred, we have thousands of people that work at Wells Fargo every day they worry about a recession happening tomorrow and that’s how we have to run a business. Frost: I want to touch on long-term growth because your loan growth for total loans average loans it’s been flat this year, your peers up 2 to 3%. Why is there that lag and will it catch up? Sloan: there’s always a story. In fact, what you see in our loan growth is that we have some legacy portfolio, residential mortgages that we acquired from wachovia ten years ago, home equity portfolio that’s running down because there are legacy loans that we wouldn’t be originating today. We decided about two years ago to be a little more conservative in the auto business and we let our originations decline a little bit we’ve made enough changes and are more comfortable with that business so you’re starting to see loan growth in the auto business we see credit card growth. We see growth otherwise in residential mortgage our cni book is growing nicely on the wholesale side the other area that’s been a little bit slower is on commercial real estate we’re being cautious today. Frost: I want to talk about the fed asset cap. That they placed originally the tone that came from the bank is that you wanted it or hoped for it to be lifted by this fall which hasn’t happened what’s the hope now as to when that limit to your growth might be removed from the fed? Sloan: so originally we were hoping it would be lifted by the end of this year and what we’re -- our view today is that we’re operating under the asset cap and our expectations are some time in the first half of next year but Wilfred, it’s on us to make sure that we’re making the improvements that we talked about with the Fed in operational and compliance risk, to be able to demonstrate that they should be comfortable to lift the asset cap we’ve got plans in place we’re executing on those plans we’ve got a terrific leadership team on the risk side. So I’m optimistic that we’ll continue to make progress. But we need to demonstrate that we’re deserving of the asset cap being lifted. Sloan: no not really. When we first addressed the asset cap, what we did was we reduced the number of nonoperational deposits or deposits from financial institutions around the world. They tended to be lower value in terms of returns and the like. That gave us more than enough capacity to be able to operate under the asset cap. So it’s not affecting our ability to serve our customers today or grow that customer base. Frost: wanted to touch on the sales practice scandal and what’s happened since number of times on earnings calls, television interviews, you sort of suggested that you thought the worst was behind you. Yet as recent as October the chief administration officer, chief auditor were placed on leave because of “historical retail banking sales practice issues” when will you be able to say once and for all that the cleanup is done? Sloan: I don’t think we ever want to say and declare victory on anything because I think part of the experience that I’ve had at being in this role is that you need to continue to raise the bar in terms of expectations on all your products, all your services, all your operations, day in, day out. I will tell you that in terms of our review, which when I stepped in this role in the fourth quarter of 2016, I said look, we’re going to look everywhere within the company, every drawer we’re going to look at processes, people, policies, everything we’re well through that process that review process and we’ve been very disclosive in terms of if we find anything we report it it creates a little instability but I think it’s the right thing to do. Frost: as part of that process, you looked into not just the consumer bank where the original problems were, but across all of your business. Sloan: every one of our businesses, absolutely. Frost: and, indeed, as you said have disclosed some problems you found there, some foreclosure of homes this spring, for example do you think if other big banks did a similarly immersive review of their business lines they would find similar issues? Is there an unfair focus on Wells Fargo? Sloan: no. Look, I don’t want to -- my responsibility is to be CEO of Wells Fargo. I think that major banks in this country are very well run. I think as an industry, we’ve made a lot of progress in terms of addressing regulatory issues, post-crisis, in terms of improving products, service and the like I’ll let you ask that question to our competitors. Frost: okay. Well, I will do that. Sloan: do we wish we were operating under an asset cap absolutely not is it our responsibility to demonstrate that we’re going to make the changes to not only meet but exceed regulatory expectations to have the asset cap lifted it’s on us we’ll take care of that. Sloan: I think what’s going on right now in each of our regulators, there’s a review of some of the changes being made, new regulations, policies, procedures post-financial crisis and whether or not those are working as planned and one example could be the capital planning process there’s been a lot of discussion at the fed as to whether or not they would want to make some changes. I think that’s all good. I don’t think it makes any sense for the pendulum to swing all the way back to where we were in 2006 or ’07. We never want to go back there and we think -- I think a number of regulatory changes that have occurred in the oversight has been good for the industry we have more liquidity in capital now than we ever have. We’re in such great shape to be able to withstand, if you go back to the earlier question, any sort of economic downturn. Sloan: we didn’t talk about the mix. He allows and wants us to run the business the way we see fit. That’s my job. He always wants more return, as any of our shareholders do but we have got to make sure that he appreciates that we’re continuing to buy back our stock at a pretty rapid pace in addition to raising the dividend because he wants to stay under that 10% cap. 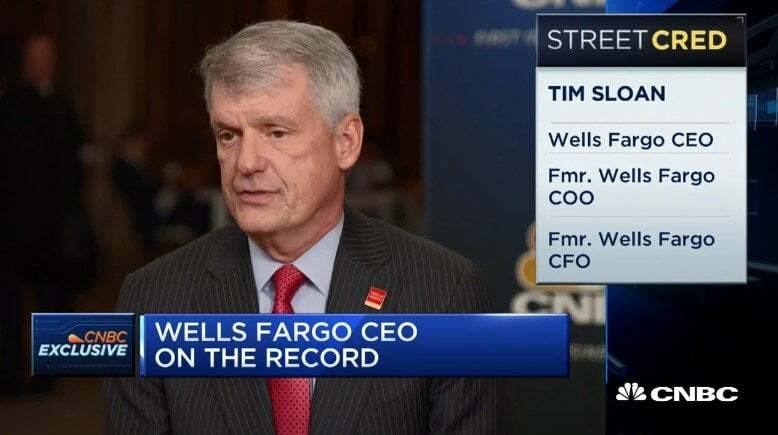 Frost: Tim always a pleasure to speak to you thank you for joining us today Tim Sloan, CEO of Wells Fargo. Back to you.